Whatever happens with your baby is quite exciting. Although you should be a full grown up human with perfect functioning organs, with hair on your head, teeth in your mouth and abilities of talking and going to the toilette, you won’t be able to prevent yourself from screaming out: Oh, he is having his first tooth! Such cute hair coming out from the cutest baby ever, Bravooo! You peed all on your own!, and the list goes on and on. Your baby’s life is a sure great thing to observe, in fact, from the day it is conceived in his mother’s womb. Baby’s first teeth, in particular, are so charming an event. Brushing your baby’s teeth is the first step towards his overall future oral hygiene. The eruption of teeth usually coincides with giving your baby solid foods. His teeth, therefore, are in constant contact with foods. Such environment makes his milky teeth prone to decaying if not properly taken care of. Brushing your baby’s teeth can be quite peculiar to you. We shall make it simple as should be. This toothbrush is designed to lay very soft touches on your baby’s teeth. It is made from 100% BPA, latex, lead, phthalate free and FDA approved materials for 100% safe brushing. Each pack contains 3 RADIUS baby toothbrushes, which means you can change them more frequently. This is your fabulous solution to start right in cleaning your baby’s teeth; removing plaque and avoiding tooth decay. Use it daily with your baby toothpaste for best results. When it is time for your toddler to take responsibility of his own oral hygiene, give him this tooth brush. Its safe curved design with its oval head gives your toddler a good hand grip and allows him to brush alone without any dangers on his delicate gums and teeth. The handle of this brush is tapered so that it fits either a toddler hand or an adult’s hand. It is made from 100% BPA, latex, lead, phthalate free and FDA approved materials for 100% safe brushing. Each pack contains 3 RADIUS Totz toothbrushes. This is a finger baby toothbrush made of skin soft silicone. This toothbrush functions very well in cleaning your baby’s teeth. However, this is not its sole mission. 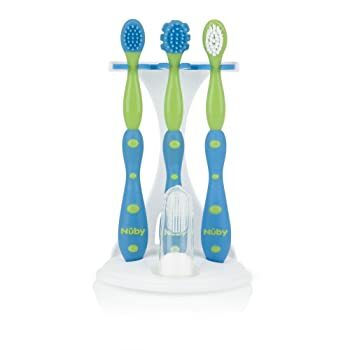 Nuby have four stage oral care system. The first stage is a silicone massager. This is perfect for any new teeth and gums that may have started going into that horrible ulcered stage when the teeth are about to break through. Stage-2 is a massaging brush which is like a double sided toothbrush with short and rubbery bristles. Stage-3 is also a massaging brush to help teach toddler proper brushing habits with multiple surfaces for effective cleaning in all directions. This also comes with a carrying case for easy and immaculate storage. 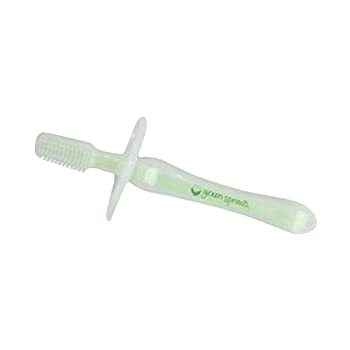 Your baby is sure to love brushing using this item. Let brushing be fun! For cleaning and chewing, this is your option. This silicone coated toothbrush is very soft on your baby’s teeth and gums. You can also hand it over to your kid as a teether to soothe his gums and alleviate teething symptoms. It also comes with some sort of wings to prevent your kid from gagging on it. The green sprouts make it a very attractive teether for your baby. This combo of a soft bendable infant toothbrush along with a safe baby toothpaste sounds very tempting. Shaped like an elephant, this toothbrush makes it easy, fun and safe for your child to brush. The toothpaste contains no fluoride. It is safe to swallow and has no artificial colors or preservatives. 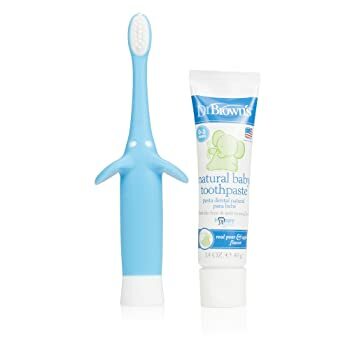 Use this toothbrush on your baby first teeth using a tiny bit of the toothpaste to have ultimate results of a clean mouth. Did you know that teeth start developing in the foetus? They certainly do. Teeth are parts of the bones that develop inside the womb. That’s why good nutrition from the mother during pregnancy is important in the development of the teeth. Calcium, phosphorus, vitamin C, and vitamin D are amongst the most important things that a pregnant woman’s diet should contain. When the foetus is 6 weeks of age: The basic substance of the tooth forms. 3 to 4 months of gestation: The hard tissue that surrounds the teeth is formed. After the child is born: The tooth actually protrudes through the gum. At the age of 5 years: The loss of the primary “baby” teeth occurs. Each baby’s teething process steers towards having 20 primary, or milky, teeth. The first teeth to erupt are the lower and upper incisors. About one tooth comes out per month. 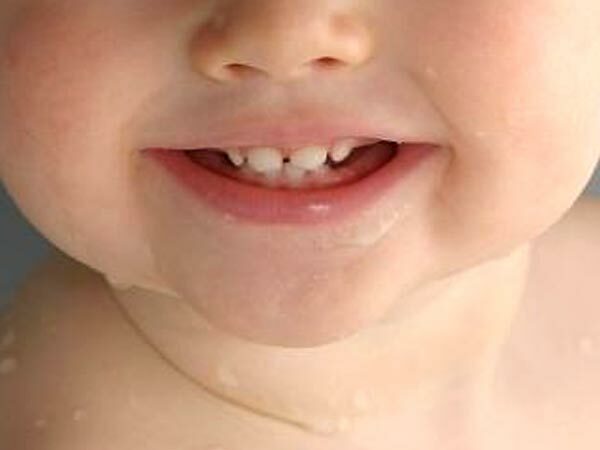 Moreover, baby’s teeth usually have gaps in between; leaving room for the larger permanent teeth to erupt. Enamel: This is the outer layer of the tooth and the hardest material in the body. Dentin: The inner layer and the main part of the tooth, forming the largest dental tissue. Pulp: The is the soft tissue on the inside of the tooth that contains the nerve, blood supply and the ability to produce dentin. Root: It is the part of the tooth that secures it into the jaw. Sugar is a creepy monster that, amongst its many harmful impacts, causes tooth decay. Speaking specially about teeth, this is not about the amount of sugar you give to your baby, but rather about how long and how often your baby’s teeth come in contact with sugar. Nothing is easier than soothing your baby with a lollipop or sweet drink in a bottle. His giggles are charming indeed. But, be ware that such items shower your baby’s teeth in sugar for a long period of time, let alone the harmful impact of acids that are found in fruit juice. You can go for whole fruits and milk, as they contain natural sugar that is less likely to cause tooth decay. Encourage savory food and drinks with no sugar. Read the labels of your store-bought baby food. Sometimes sugar is in rusks and baby drinks. Offer sweet food and drinks at mealtimes only. Dilute one part juice to 10 parts water. No biscuits or sweets, demand your family and friends to do the same. Offer your child at bed time any of these: breast milk, formula or cooled boiled water. Always opt for sugar-free medications, if possible. A piece of clean gauze can do the job for you at the beginning. You can simply apply a tiny plop of toothpaste on it and rub your baby’s teeth. However, you will have to alter to using a toothbrush for more efficient cleaning. This will make it easier to reach all parts of your baby’s teeth. It shall also instill the habit of brushing the teeth in his mind. You can choose from: attractive infant toothbrushes, finger baby toothbrushes or electric baby toothbrushes. Be ready to upgrade to a toddler toothbrush once your kid is ready to take in the responsibility. Attractive: Make it fun. Pick a toothbrush that will dazzle your kid and encourage him to brush. You can focus on his favorite colors. Easy: If your kid is keen on doing things himself, choose a toothbrush with a subtle easy hand grip. Gentle: Baby’s teeth are still soft, that is why you have to make sure the bristles are gentle on his teeth. * Make sure you replace your baby’s toothbrush regularly. If the bristles start to spread out, it’s a sign that the toothbrush needs changing. Incorporate teeth brushing into your daily routine twice, preferably in the morning and before bed (after the last drink). Although everyone has his own personal way to make his baby brush, you can ease the process off by sitting your baby in your lap with his face away from you. This will make you reach his teeth easily. Brush his teeth in circular gentle movement; focusing on the area where the gum and teeth meet. Make sure your baby spits out the remaining toothpaste. However, leaving the residue of the toothpaste to work on your baby’s teeth makes it more functional. Therefore, don’t rinse his mouth with water. As soon as you see your baby’s first tooth, you need to consider brushing it amongst your daily chores. It does not matter if you don’t brush much at first. You only need to focus on getting your baby used to brushing their teeth as part of their daily routine. Set a good example and show him how you care about your own teeth. Teething can be harsh. At any time between 3 months to 12 months, expect a tooth to erupt through the gums of your baby. At the age of 3 years old, 20 primary teeth should sit firmly in your baby’s gum. The lower front teeth usually come in first. Upper front teeth usually come in 1 to 2 months after the lower front teeth. You shall be alarmed though way before the first tooth erupts. Some babies get fussy and cranky while teething. This bad mood is usually the cause of soreness and swelling in the gums. Such symptoms disappear right after the tooth breaks the skin. However, some babies are not at all affected by teething. Biting their fingers or toys and/or refusing to eat and drink are the first signs that tell you your baby is teething. Excessive drool, that might cause a rash on the chin, face or chest is another sign to look for when your baby is teething. Rub your baby’s gum for about 2 minutes with your clean finger or a cold teething ring. Even when your baby protests in the beginning, he shall find this to be very soothing. Teething is an important milestone in your child’s life. It means he is having his first adult-like resemblance. A life of solid foods, nutritious choices and food negotiations is to follow. As this process, when your child is having his first primary teeth, takes place, you need to be mindful about its symptoms. Most babies get their first tooth between 6 to 10 months of age, finally having their 20 milky teeth set by the age of 3 years. While each child is different as to when his first tooth erupts, each child is affected by teething in a different way. From sever soreness to mild fussiness to nothing at all, such symptoms occur about 3 to 5 days before a tooth breaks the skin and can be present for up to 1 or 2 months. Teething comes hand in hand with the time you start introducing foods other than breast milk to your baby. This means that first teeth get a first hand experience of bacteria that causes decay. Shielding your baby against such bacteria and possible hazard is rather simple but needs to follow a robust technique. Healthy food is your first important haven. Give your child nutritious foods that will strengthen his body and health. Be careful about your choices and make sure you choose foods that reduce the risk of tooth decay. Those foods include whole grains, vegetables, and fruits. You can also introduce Mozzarella and other cheeses, yogurt, and milk as delicious snacks as they are good for the teeth and clear the mouth from harmful sugars; protecting teeth against plaque. By all means, do not allow for a prolonged contact with any sugar intake. It is a good idea to take the bottle from your baby’s mouth before he falls asleep. This helps avoiding bacterial acids that cause tooth decay in the mouth. Brushing is a chore now, no matter how small the tooth might look. You have to teach your child to brush and floss everyday. When you see this little white pearl coming, be prepared with a good toothbrush and incorporate its use into your routine. Very gently, apply a tiny amount of child suitable toothpaste and rub it against your child’s tooth in circular soft motion. If your baby is reluctant at the beginning, turn it into a game. This works as magic with babies. Pick a toothbrush that is attractive and easy to handle. Let him hold it. Show him how to use it. Have him in your lap with face facing out, and start brushing his teeth. It is a good idea to take good care of your teeth for multiple reasons. On the first hand, you set a good model for your child. On the other hand, you keep your teeth and mouth healthy and void of the saliva that contains harmful bacteria; thus being less likely able to transfer these bacteria that cause tooth decay to your baby. Don’t share spoons and utensils with your baby for the same reason. Keeping the health and cleanness of your child is a very important issue. It takes effort and planning. Sometimes it takes tweaking and playing to instill the habits you want in him. Brushing with a good toothbrush is a very important habit that needs to accompany your child from the moment he has his first tooth. It is the habit that shall prevent grave issues from popping up in his toddler years and pave the way for healthier adult years to come.